It’s amazing what you can make with a lonely courgette and carrot at the bottom of your vegetable basket. These fritters are delicious hot or cold so would be ideal to take on a picnic or pack in a child’s lunchbox. I served mine up hot with my left-over turkey burgers and a side of pineapple chutney and we thoroughly enjoyed them. I substituted buckwheat flour for the plain flour as my husband is gluten intolerant, and I used my lemon ‘granules’ straight from the freezer. Anyone using lemons or lemon zest a lot, these frozen granules are amazing so check them out here. I’m finding new uses for them every week. Grate the courgette and carrot using the course side of a grater. 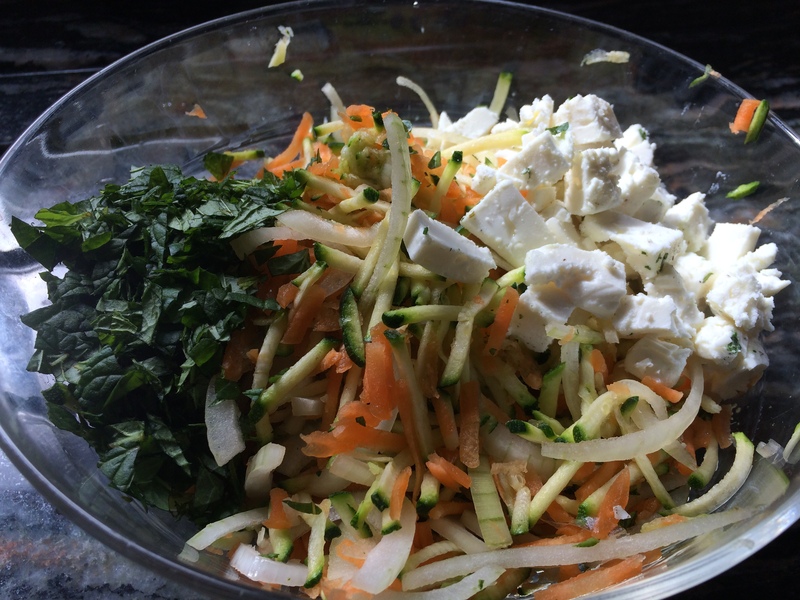 Mix with the onion in a bowl, together with the egg, flour, baking powder, feta, mint and lemon granules or zest. Season with a little salt and plenty of pepper. Heat your preferred oil in a fry pan. Carefully, using your hands, make six fritters (each about the size of your palm). Fry for at least five minutes over a medium-high heat. Carefully turn over and fry on the other side over a slightly lower heat for a further five to seven minutes, or until cooked. I found it easier to fry three at a time, keeping the first three warm whilst I fried the second three. Tip: If you find the mix quite soft, pop the formed fritters into the freezer for half-an-hour to stiffen up before cooking. 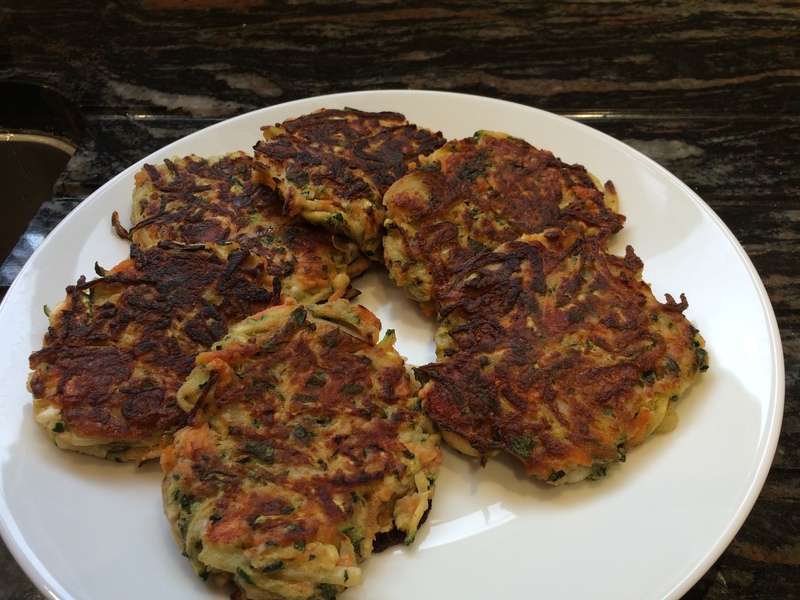 This quantity makes six fritters and the recipe is adapted from the book Thrive on Five by Nina and Jo Littler. 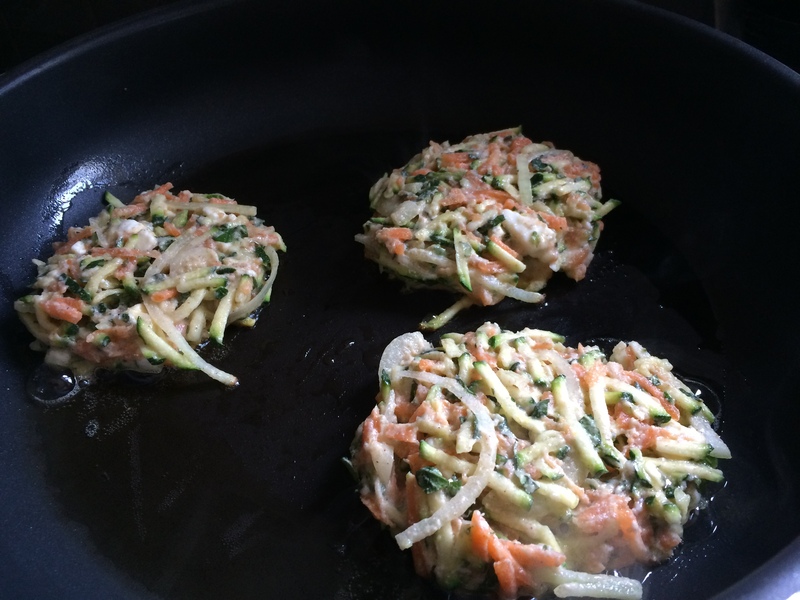 This entry was posted in Brunch, Supper, Vegetables, Vegetarian and tagged Buckwheat, Carrots, Courgettes, Fritters, Gluten Free, Healthy Eating, Lemon Zest, Supper, Vegetarian, Wheat-Free. Bookmark the permalink.